Another great weekend of kayaking. We’ve had some evil cold spells recently but happily last weekend we had a some fluffy warm rain clouds over North Wales. As detailed on the trip report , and Adam’s blog, we paddled the Dwyfor on Saturday, and the Wnion on Sunday. 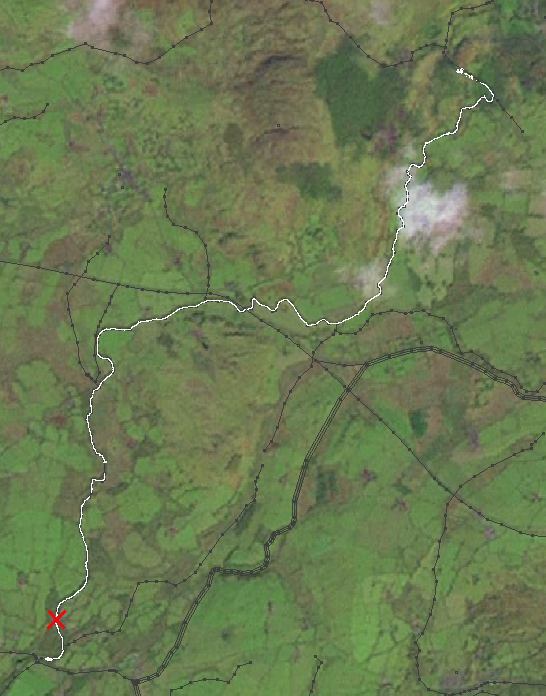 Both completely new rivers, except that I do remember paddling the easy bit at the bottom of the Wnion before. The Grade 4 bit coming before that was a pretty awesome highlight of the trip. And I had also been taking lots of photos to remind me of whitewater grades and other details for the map such as footbridges and power lines which we’d passed underneath, but unfortunately ‘X’ marks the spot where I dropped my digital camera in the river and lost it! It is a waterproof camera. I dropped it into the river at latitude:52.9394149 longitude:-4.2483416 (well actually about 10 metres upstream from there) I know this because after spending about 10 minutes wading around in the current trying to find it, I recorded a waypoint on my GPS. I thought maybe it might make an interesting accidental geocache for somebody. Only trouble is, I notice on the description there it’s only supposed be waterproof for up to 3 hours. My poor camera has been languishing on the river bed for 2 days already. How long before somebody rescues it?! I bought that camera seven months ago , so not really a very good innings. It’s annoying to have lost it for such a stupid reason. I had it tied to me, but the crappy bit of string was too fat, and the knot evidently untied itself. But in truth the Pentax Optio w30 is a pretty pants camera. Not a very smart purchase. It was starting to annoy me. I had decided to go for a waterproof one, without testing one in the shop first, thinking surely all compact digital cameras are much-of-a-muchness these days. At first I was terrified of submerging it because it really doesn’t look waterproof, but actually the waterproofness was fine. For general use though, it took way too long to switch on and be ready for taking a photo, and it took about an hour to focus in the dark. Yes. My failure to map anything at all this weekend is the most upsetting thing about losing the camera. When a geocacher finds it, take out the batteries & sd card, put in a piece of paper with your name and a battery-sized pencil and toss it back into the river for others to find it. That’s the spirit! Alternatively, you could say you used the wrong knot. Yeah. I’m not very good at tying knots. Never went to scouts. Come to think of it, why do the canoe club always get me to tie the boats on the minibus roof? I don’t actually full understand the concept of geocaching. I take it you’re supposed to leave stuff in the same place with your name logged there? That’s not going to work in this case now is it? Harry, what is your email address? http://www.harrywood.co.uk:80/contact-harry.php is very coy. I just happened on this post by accident. I can’t tell you how many times I’ve been out and about most of the time geocaching for myself and I end up losing something. (backpack, lens, lunch, sunglasses, etc.) I’ll have to keep your idea in mind and at least capture an approx coord and send the world out to help me find.